Schwartz & Wade, 9781524765729, 40pp. Evoking picture book classics like Aaron Becker's Journey and Chris Van Allsburg's The Polar Express, here is an emotionally rich bedtime picture book about a lonely child's nighttime adventure that is also a showcase for the extraordinary illustrations of Daniel Miyares. 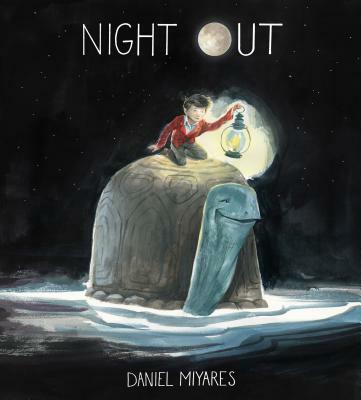 Daniel Miyares is the author/illustrator of Float, an ALA-ALSC Notable Children's Book of the Year, which The Boston Globe called "a perfect wordless picture book;" Pardon Me!, which PW declared "Follows in the footsteps of Jon Klassen"; and Bring Me a Rock! He also illustrated Surf's Up by Newbery Medalist Kwame Alexander. He lives in Kansas City, Missouri, where he works at Hallmark Cards. Visit him on the Web at danielmiyares.com or follow him on Twitter at @danielmiyares.